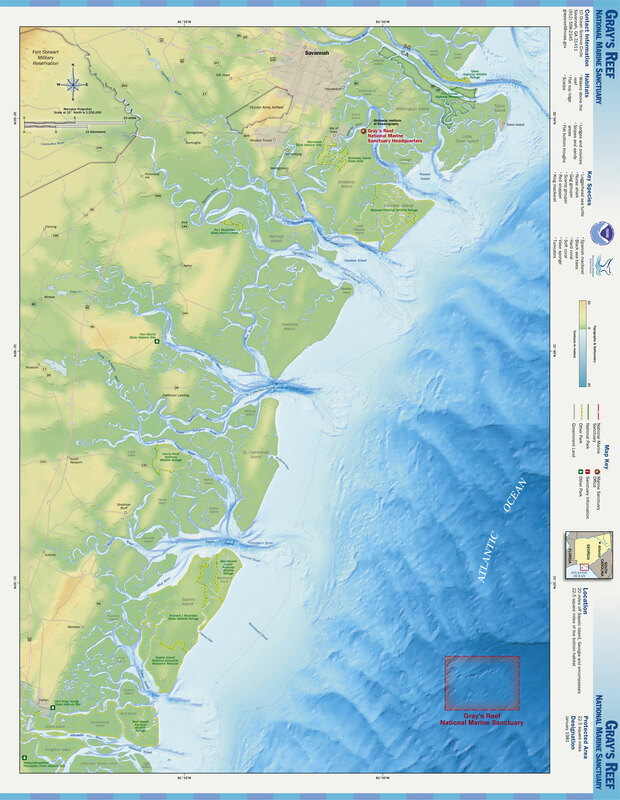 Gray's Reef National Marine Sanctuary is one of the largest near shore "live-bottom" reefs of the southeastern United States. It is just one of 14 marine protected areas that make up the National Marine Sanctuary System and is governed by the National Marine Sanctuaries Act. The Sanctuary is located 19 miles east of Sapelo Island, Ga. between Savannah and Brunswick, Ga. Click here for a location map. It encompasses 22 square miles (about 14,000 acres) of live-bottom and sandy bottom habitat as well as the overlying water column. Direct access to the reef itself requires experience in open-ocean diving; so the opportunities for a first hand encounter with the Sanctuary for novice divers are limited. However, the Sanctuary is popular with recreational anglers, boaters and more experienced divers. Click here for information about diving at Gray's Reef. Click here for information about fishing at Gray's Reef. For the full text of sanctuary regulations, see 15 CFR 922 Subpart I .